These colour palettes are taken from images of famous places all over the world. Chosen for one reason–they all have a colour in the name. >I created these colour palettes from photographs using Adobe’s Color utility (formerly Kuler). Which is dead easy even if you haven’t got an Adobe ID! 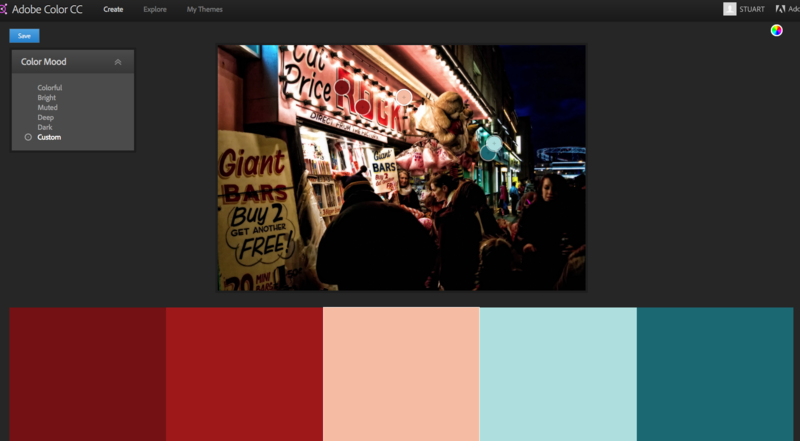 Editor’s note: Make your own themes with our tutorial: How do I create a Photoshop colour theme? Before we get stuck into the palettes I want to draw your attention to some other utilities you can use to generate collections of colours. By utilising any of these you can create palettes and hex combinations of your own in no time at all. You’re welcome to use these colour palettes as you wish. To do so, click the image to view them on Adobe Color and save them to your library. If you don’t have an Adobe login, you can still click ‘edit copy’ via the link and view the hex codes for each colour in the palette. 2. The Black Forest, Baden, Germany. 4. The famous Eau Rouge corner of Spa Francorchamps motorsport circuit, Belgium. 5. The Golden Gate Bridge, San Francisco, USA. 6. Green Park, London, England. 7. Green Park, London, England. 8. A terrace of colourful houses, Greenland. 9. A huge sinkhole in Belize, called The Great Blue Hole. 14. White Sands missile range, New Mexico. 15. A railway bridge crossing, Whitechapel, London. 16. Yellow Gorge, Kewsick, England. 17. Yellowstone National Park, Wyoming, USA.